Winner of the 2009 Ray Allen Billington Prize, presented by the Organization of American Historians. At the foot of the snow-capped Cascade Mountains on the forested shores of Puget Sound, Seattle is set in a location of spectacular natural beauty. Boosters of the city have long capitalized on this splendor, recently likening it to the fairytale capital of L. Frank Baum’s The Wizard of Oz, the Emerald City. 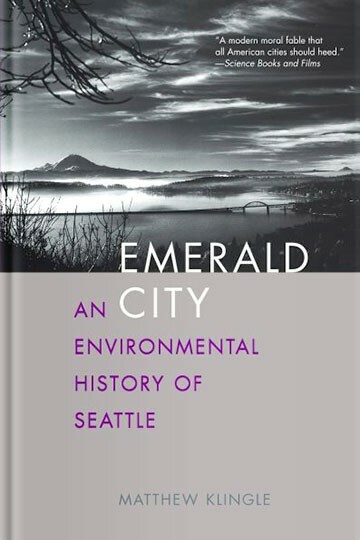 But just as Dorothy, Toto, and their traveling companions discover a darker reality upon entering the green gates of the imaginary Emerald City, those who look more closely at Seattle’s landscape will find that it reveals a history marked by environmental degradation and urban inequality. This book explores the role of nature in the development of the city of Seattle from the earliest days of its settlement to the present. Combining environmental history, urban history, and human geography, Matthew Klingle shows how attempts to reshape nature in and around Seattle have often ended not only in ecological disaster but also social inequality. The price of Seattle’s centuries of growth and progress has been paid by its wildlife, including the famous Pacific salmon, and its poorest residents. Klingle proposes a bold new way of understanding the interdependence between nature and culture, and he argues for what he calls an “ethic of place.” Using Seattle as a compelling case study, he offers important insights for every city seeking to live in harmony with its natural landscape.